Pissin' On The Roses: Is Virulent Black Death Outbreak Tied To Admitted Gay Fetish-Murder Triangle Plague Researcher? Feral dogs, out in the cold, marking our dissent, one rosebush at a time. Is Virulent Black Death Outbreak Tied To Admitted Gay Fetish-Murder Triangle Plague Researcher? UPDATE 10/30/17: Based on insider information coming out of the Feinberg School of Medicine from folk(s) directly familiar with Wyndham Lathem and the possibility that this Plague outbreak is his work, we are raising this outbreak to Maximum Alert situation. The highly unusual outbreak of airborne Pneumonic Plague in Madagascar may be manmade and of higher threat to humanity than might otherwise be expected. In August the PORTBLOG team warned about the potential for an outbreak of Pneumonic Plague tied to the arrest one of the world's top Pneumonic Plague researcher's as the mastermind behind a truly bizarre gay fetish murder triangle. Reported captured in national #manhunt, a #Northwestern #PneumonicPlague researcher accused of murdering 1 of his gay 3some#Outbreak next?? Fast forward two months, and a highly unusual Pneumonic Plague outbreak is underway in Madagascar, and it has been declared at risk of spreading internationally via air travel. (4) He returned to the USA and apparently masterminded a Fetish Murder Ritual with a stranger to murder multiple people, including himself and his coconspirator. (5) His apparent profile fits the type of person who would engage in a Bioterror murder. (9) Since his arrest Wyndham Lathem admitted that: 'he's not the person people thought he was'. 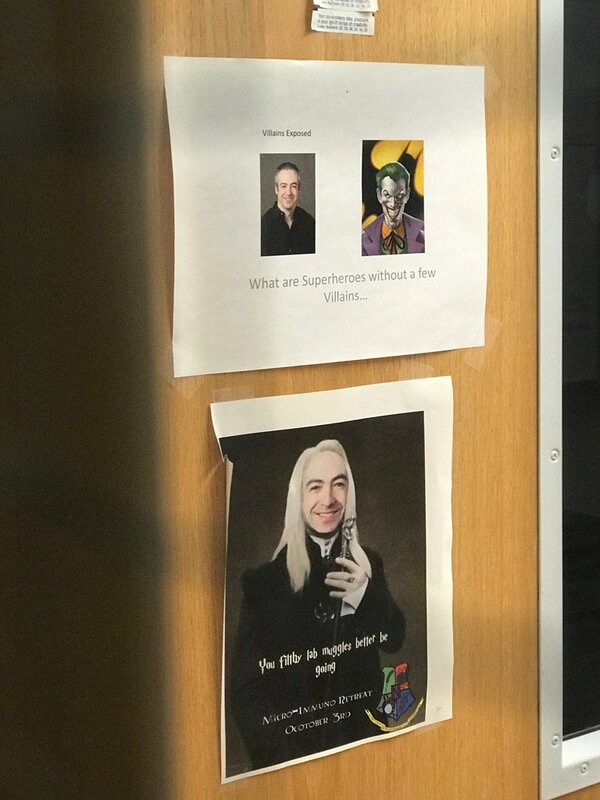 (10) This is a photo of his LAB door at Northwestern, note he sees himself as the villains JOKER and Lucius Malfoy. We know what Batman's Joker did with BioWeapons, and that Malfoy ancestors had used Plague to murder muggles. (11) The US ARMY has released a request for experimental drugs to fight Biowarfare versions of Plague. (12) During the time frame he traveled to Madagascar and was appointed to be the Lead Plague scientist at Institut Pasteur he would have known that this Airborne Outbreak would result in a massive amount of Funding Grants and Television interviews for him. A force multiplier for that money and fame motive is it would also fulfill the Fetish Murder Desires that eventually resulted in his arrest for murder. (13) Lathem has been working on genetically modifying Pneumonic Plague, his published work on suppressing the expression of Plasminogen-Activating Protease (Pla) could produce a Pneumonic Plague that exhibits unusual disease progression seen in Madagascar, ie lower death rates with increased opportunity for transmission. None of this proves that Wyndham Lathem is behind the outbreak, but it is coincidence enough that prudent persons might make preparations for a Global outbreak much like the World Bank just did yesterday (10/24). Check out the Blog that I was prompted to create some months ago. Therein you’ll find some of what I believe the Lord has allowed me to Glean about His End of Days Timeline. It is worth Careful Study if you have “eyes to see & ears to hear”. In no way am I predicting the Day or the Hour, but we are to recognize the Season & it is NOW! For instance in the Blog you will find, what I believe I finally had an Epiphany on about the Third Temple & The Two Witnesses. Both of which will be in the Millennium & (why/how) NOT Prior to The Rapture & Tribulation. I had been Puzzling over this for some time, since No Way they could be prior, since Nibiru is here in our skies Now, and the Stage Has also been set for the Ezekiel 38 War. Coincidentally, Nibiru effects are listed in there too in Ezekiel 38:18-23. Have (2) Blog Posts on that. It’s a Pre-Wrath Rapture and Nemesis/Nibiru will be the Trigger for the 6thSeal, which is when the Wrath of the Lamb will begin, at Revelation 6:17, during the 6th Seal Terror! From my Gleaning, the 6th Seal will be SOON Triggered by the Close Approach & Passing of the Nemesis/Nibiru System seen in our Skies NOW! You CANNOT Interpret End of Days Bible Prophecy & Ignore this! God (imho) has Revealed Much to me regarding the Incoming (Now Here) Nemesis/Nibiru System. It is the Micro KEY to All End of Days Prophecy as far as a Timeline goes; and of course Israel’s re-birth on 11/29/47 by UN decree, or from the latest 05/14/48, when Israel made her formal declaration as an independent state, would be the Macro Key. I’m leaning Strongly to 1947 and you’ll see why if you Check out the Blog. Jesus said that in the Parable of the Fig Tree, which is in regards to Israel’s rebirth as a nation; that the generation which sees Israel’s rebirth, would Witness His Return (as in The Rapture). Look at my Blog Post of https://robertdunnendtimeprophecyinsights.wordpress.com/2016/08/31/matthew-2429-31-vs-36-44-describe-perfectly-the-6th-seal-the-rapture-alleluia/ for a fuller exposition on this. A Biblical generation is widely held to be 70 years… 1947 + 70 = 2017 – So it All Fits! I post Tweets on Twitter too @robertdunn7. Please contact me if you have any questions. The Time Is NOW Very Short! GREAT JOB POTR Blog Guy -- Appreciate Your Work Sir -- See You Soon in the Clouds - Alleluia!!! Maranatha! by Ms. X . . .